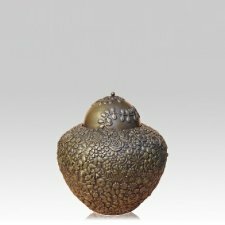 The Perennial Bronze Cremation Urn in small is cast in solid bronze. This urn features a stunning floral design that covers the body of the urn, with a beautiful bronze finish. This elegant urn is created through the ancient form of 'lost wax' method, to produce a vessel that is nothing short of a masterpiece. The small size is ideal for families who are sharing or scattering the remains, and wish to keep a small portion for themselves. Create an unforgettable tribute to the garden lover with this unique urn. Top opening lid features locking mechanism and can be sealed. "After a surprise of finding that my cat had cancer... I was caught in a spur of the moment decision, and decided to cremate. This was a first time for me. I'd searched the web for a special urn for my cat Goldie's ashes, and wasn't finding what I was looking for until I came across "Memorials.com". This was a resin life sized cat urn that I could sit on my floor and serves not only letting my cat still be with me in my home, but is also decorative. The price was right, and it came in just a few days after ordering. I will for sure remember this site should this situation arise again. Thank you for everything!"